Learn about facilitating predictive analytics in health care in this invited talk hosted by Hanghang Tong. Zoran Obradovic is an academician at the Academia Europaea (the Academy of Europe) and a foreign academician at the Serbian Academy of Sciences and Arts. He is an L.H. Carnell Professor of Data Analytics at Temple University, professor in the Department of Computer and Information Sciences with a secondary appointment in the Department of Statistical Science and is the director of the Center for Data Analytics and Biomedical Informatics. His research interests include data science and complex networks in decision support systems. 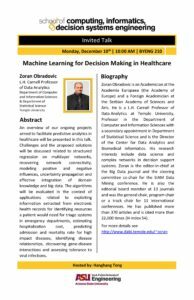 Obradovic is the editor-in-chief at the Big Data journal and the steering committee co-chair for the SIAM Data Mining conference. He is also the editorial board member at 13 journals and was the general chair, program chair or track chair for 11 international conferences. He has published more than 370 articles and is cited more than 22,000 times (H-index 54).